Welcome to the planet’s most comprehensive source of information about Pikes Peak! Pikes Peak is one of the most beautiful landmarks in Colorado. The views from the summit inspired the words to America the Beautiful. Now that’s high praise! Whether traveling by car on the Pikes Peak Highway, by train on the Pikes Peak Cog Railway or by foot on the Barr Trail, more than a half million people reach the summit every year. In fact, Pikes Peak is the most visited mountain summit in North America. All these people can’t be wrong! With an altitude of 14,115 feet above sea level, Pikes Peak forms a maginificent visual backdrop for Colorado Springs, Woodland Park, Fort Carson, the U.S. Air Force Academy, Garden of the Gods, Cripple Creek and many other regional cities and attractions. You owe it to yourself and your family to make Pikes Peak and Colorado Springs your vacation destination! Browse our information, photos, videos, and maps to learn more and to really understand why we call it America’s Mountain. 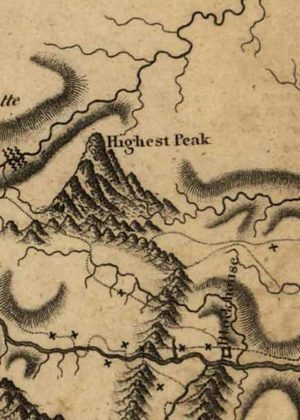 Zebulon Pike's first map of the mountain that would later bear his name.